MIIGAiK is the center of higher surveying education in Russia and the largest educational institution of this type in Europe. In early 1900–s earth engineering has become one of the key educational profiles of MIIGAiK. Today, the University is actively participating in the exploration of outer space and application of the results of this exploration to science, economy, agriculture, geological prospecting and ecology. Most of national geodetic, optical services and topographic enterprises of different countries have close and mutually advantageous economic and scientific relations with the University. Since 2008 MIIGAiK has started process of integration into European educational field. Introduction of Bologna principles and design of training programmes in line with Bologna is one of the key directions of the University further development. Interaction with European and Russian HEIs within the frames of TEMPUS programme enabled University to communicate for further developments. The universally-recognized norms of international law and international treaties and agreements of the Russian Federation shall be a component part of its legal system. Being the full member of the Bologna Process since 2003 the Russian Federation is on the position to work intensively to fulfill its obligations under the Bologna Declaration and related documents. In order to coordinate and enhance the activities expected from Russia within the EHEA context the special national consultative body – Bologna Process Working Group – was re-established under the Ministry of Education and Science in the beginning of 2015. The kick-off meeting of the 3rd WG has been organized and hosted by the Russian Federation. It took place in Moscow (MIIGAIK), 9 February 2016. The meeting was attended by the representatives of 40 EHEA countries as well as the delegates from European Commission, EL/ETUCE, ESU, EUA and EURASHE. Vice-Minister of Education and Science of the Russian Federation, welcomed the participants and took part in the opening session. In a perspective of renewing the vision of the EHEA, the first meeting was focus on the work plan and terms of reference of the working group. Moreover, MIIGAiK is a member of the Bologna Club. 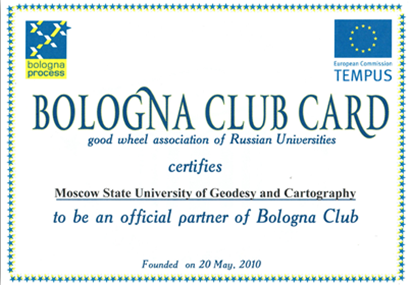 Bologna club – open association of Russian universities, voluntarily take upon themselves the obligation and responsibility of the reforming of Russian Higher Education system, finding effective ways of rapprochement of national educational systems and the creation of a single educational space, which meets the European trend to build a knowledge-based society. Since 2008 MIIGAiK has started process of integration into European educational field. Introduction of Bologna principles and design of training programmes in line with Bologna is one of the key directions of the University further development. Interaction with European and Russian HEIs within the frames of Erasmus+ programme enabled University to communicate for further developments. Dr. Nadezda Kamynina is a Rector of Moscow State University of Geodesy and Cartography. Mrs. Kamynina represents Russia in the Bologna Process and acts as a secretary of the Bologna Process Group of the Ministry of Education and Science of Russia. She is also a certified Higher education reform expert of the Russian Federation and a leader of the regional HEREs’ team. For the last 15 years Mrs. Kamynina has been actively promoting international cooperation in education participating in the initiatives of the European Commission (Tempus, Erasmus+) and international programs of the European universities (e.g. Visby program). Mrs. Kamynina has impressive knowledge and experience in international project management. She managed as a grantholder of the TEMPUS project “Independent Quality Assurance model for degree programmes in Russia” (530838-TEMPUS-1-2012-1-RU-TEMPUS-SMGR). Mrs Elena Ponomareva has a master´s degree in Regional studies (international relations). She has been involved in higher education since 2007. At MIIGAiK she has been working in International Academic Cooperation Department since 2012. Mrs Elena Ponomareva has a large experience in management several Tempus project such as “Project-oriented methods in Russian Universities” (SM_SCM-T023B05-2005), “Tuning Russia” (511135-TEMPUS-1-2010-1-ES-TEMPUS-JPCR), “Independent Quality Assurance model for degree programmes in Russia” (530838-TEMPUS-1-2012-1-RU-TEMPUS-SMGR), and 3 more projects. Also she has an experience in organization of international qualification programmes and double degree programmes. Mrs Inna Ponomareva has an experience in management several Tempus project such as Elaboration of Qualification Framework for Land Management Studies at Russian Universities (530690-TEMPUS–1–2012–1–PL-TEMPUS-SMHES) and “Independent Quality Assurance model for degree programmes in Russia” (530838-TEMPUS-1-2012-1-RU-TEMPUS-SMGR).